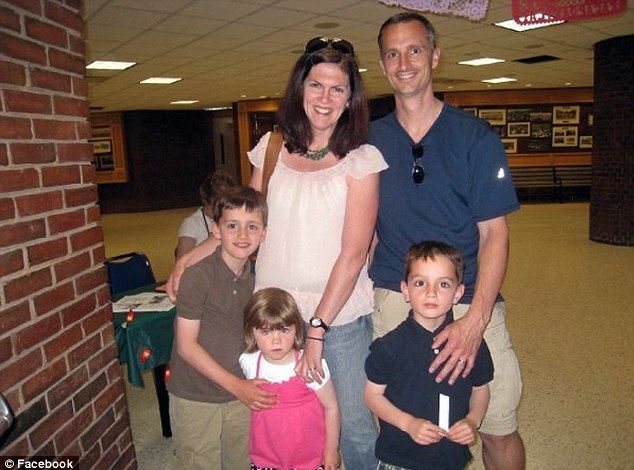 Home Tags Posts tagged with "martin richard"
The family of 8-year-old Martin Richard, who was killed in the Boston marathon bombings, has revealed the heartbreaking moment their daughter Jane awoke two weeks after the attack and learned her brother had died. 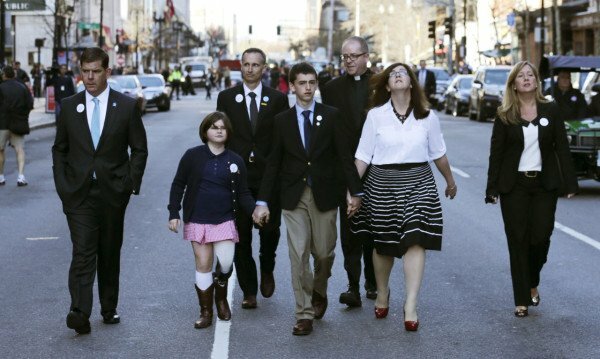 Jane Richard, 7, lost her leg in the April 15 blast, while her mother Denise, 42, suffered head injuries, her father Bill, 42, was hit by shrapnel and her brother Martin lost his life. Only her oldest brother, 12-year-old Henry, escaped without injury. In a statement released on Thursday, the family revealed Jane awoke two weeks after the attack “with difficult questions that needed to be answered”. “There are not words to describe how hard sharing this heartbreaking news was on all of us,” it read. Amid the tragedy, the family is celebrating the progress of little Jane, who has now undergone her eleventh surgery to close the wound on her left leg and to eventually prepare it for a prosthesis. Jane Richard has battled infections in hospital and faces more surgeries after losing her leg below the knee. “While she has more trips to the O.R. ahead of her, last night’s operation marked an important milestone,” the statement read. Bill Richard is recovering from his shrapnel wound and is hopeful that he will regain hearing he lost from the blast, while Denise is recovering from her surgeries, but is still missing sight in one eye. 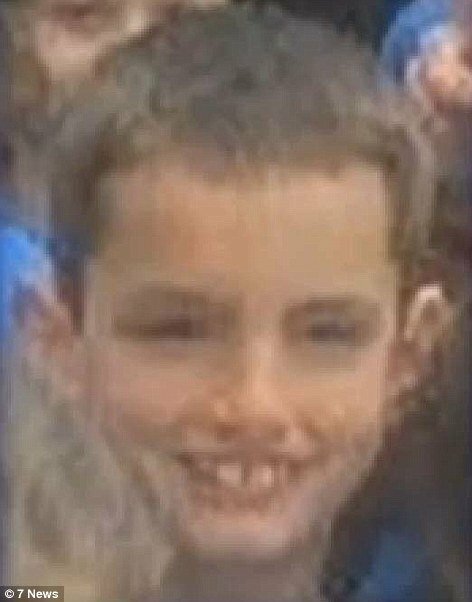 Henry Richard has returned to school, “which gives him a needed sense of routine and normalcy”, the statement, which was uploaded to the family’s website, said. The Richards also took the time to thank members of the public and authorities for their help throughout “our very darkest hour”. “We want to thank the people who quickly got to Jane and addressed her injury in the street because they saved her life,” it read. 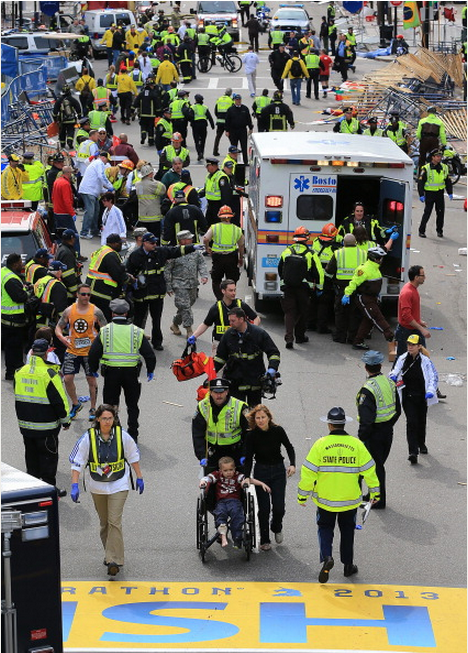 Images from before the blast appear to show Bill Richard, 42, a community organizer, holding his youngest children up on the railings as Dzhokhar Tsarnaev plants his backpack bomb just behind them. Bill Richard and his son Henry, 12, managed to escape from the bomb attack uninjured. Police believe they were planted by brothers Dzhokhar, 19, and Tamerlan Tsarnaev, 26. After their images were released by the FBI, Tamerlan Tsarnaev was killed in an ensuing gunfight with police. Dzhokhar Tsarnaev was found hiding in a boat outside a home hours later and was treated in hospital for an apparently self-inflicted gunshot wound to the neck. He remains in federal prison in Massachusetts and is charged with using a weapon of mass destruction. For updates from the Richard family, visit their blog. An amateur video has revealed how off-duty firefighter Matt Patterson came to the rescue of 7-year-old Jane Richard in the Boston Marathon terror attack which killed her 8-year-old brother Martin. Matt Patterson wearing a red T-shirt is seen rushing to the aid of little Jane Richard, who lost a leg in the attack and remains hospitalized in a critical condition. Jane Richard is seen sitting up and then lying in the middle of the road, moments after standing on the sidelines where she was photographed alongside her brother Martin. The photograph reveals how Jane and Martin Richard were standing just yards from terror suspect Dzhokhar Tsarnaev. Following the bomb attack others are filmed standing around stunned but Matt Patterson leaps into action. Just before the explosion the firefighter had been enjoying a meal with his girlfriend in a nearby restaurant. “This child for some reason just jumped at me – it was tunnel vision,” Matt Patterson said. Matt Patterson and the other man ran with Jane Richard to a waiting ambulance. The girl has lost a leg and remains in a critical condition in hospital but is expected to survive her injuries. Yesterday it emerged Jane Richard is an enthusiastic Irish dancer having attended classes at the Clifden Academy of Irish Dance in Milton since the age of three. Several Irish dance groups are now raising money to support her. 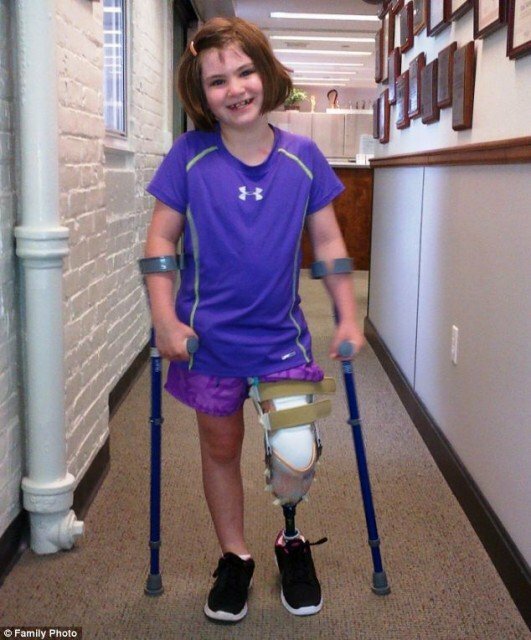 Eight days after 8-year-old Martin Richard was killed in the Boston Marathon attack, his family still has an anxious wait for news on his little sister, Jane, who has lost a leg and remains in a critical condition, it has emerged today. Jane Richard, 7, is believed to have been standing on the marathon fence next to the big brother she idolized when Monday’s blast took place. Father Bill and mother Denise – who also suffered head injuries – are having to remain strong for Jane, who is fighting “multiple injuries” from the terror attack after losing a leg. Bill and Denise Richard buried their second oldest son, Martin, in a private funeral today while Jane remains hospitalized. “The outpouring of love and support over the last week has been tremendous. This has been the most difficult week of our lives and we appreciate that our friends and family have given us space to grieve and heal,” Bill and Denise Richard said in a statement. Jane Richard is an enthusiastic Irish dancer having attended classes at the Clifden Academy of Irish Dance in Milton since the age of three. “She is just a beautiful little girl. We taught her since she was a baby, pointing her little toe,” Eileen Dillon Dinn, owner of the Clifton Academy, told the Irish Voice. Jane Richard loved to learn all the new moves at the academy, according to her teacher, and was on the sidelines at the recent Irish World Dance Championships in Boston dreaming that someday she would get the chance to compete. “She’s a beauty, always smiling,” said Dillon Dinn. Jane Richard’s eldest brother Henry, 12, and father Bill managed to escape from the bomb attack uninjured. Images from the scene appear to show Bill Richard, 42, a community organizer, holding his youngest children up on the railings as Dzhokhar Tsarnaev plants his backpack bomb just behind them. It isn’t clear whether any of the women in the photograph is the children’s mother, school librarian Denise Richard, 43, who sustained head injuries and had to undergo brain surgery following the attack. A spokesman for the family said he was unable to confirm the identities of those in the marathon image or provide an update for Jane Richard’s condition given she is under a privacy order. The Children’s Hospital of Boston did not identify the 7 year-old girl they said was still in a critical condition. However, previous reports of the injured suggest that Jane Richard is the only one of 11 or so youngsters injured in the terror attacks that fits the sparse description. The family were watching elated runners cross the finish line on Monday. Bill Richard is a former marathon runner himself so the young family liked to support other participants in the event, according to friends of the family. Neighbors said Jane Richard looked up to her older brother, Martin, and they both attended the Neighborhood House Charter School in Dorchester, where their mother served as the school librarian. Tracey Monroe, a bystander who came to Jane Richard’s aid in the moments after the blast, told WCVB.com: “I saw her laying in the street. I held her head in my hands and I tried to rub her and comfort her. I asked what her name was and she said Jane. The bombs, described by experts as makeshift anti-personnel devices, were made from pressure cookers packed with shrapnel and ball bearings to cause the maximum injuries to those caught in the blast. Dzhokhar Tsarnaev, whose older brother and suspected accomplice Tamerlan Tsarnaev was killed in the manhunt to track the bombers down, has been charged with using a weapon of mass destruction against persons or property. The Boston Marathon bombing killed three and injured more than 200, 48 of whom were still in hospital today, three in a critical condition, according to Reuters. Bill Richard returned to his house in Dorchester, Massachusetts, looking like “a walking dead” after losing his 8-year-old son Martin, and wife Denise and 6-year-old daughter Jane were seriously injured in Boston Marathon attacks. Martin Richard had just got ice cream with his family and had returned to the finish line with them watching runners cross the finish line when he was killed by the second of two terrifying blasts that went off 12 seconds apart at the marathon’s finish line just before 3 p.m. on Monday. Jane Richard, 6, lost a leg in the explosion and his mother Denise is in hospital after undergoing brain surgery. Martin Richard’s older brother, 12-year-old Henry, escaped injury while his father suffered minor shrapnel wounds to his legs. According to the Boston Globe, Martin Richard may have cheated death after walking out to embrace his father who is an avid runner but wasn’t competing in the marathon because of an injury. When Bill Richard walked on, Martin turned back to rejoin his mother just as the bomb exploded. Neighbors said Bill Richard returned home still wearing hospital scrubs on Monday night, struggling to come to terms with how, in a few seconds, his family had been ripped apart. In a statement released on Tuesday, Bill Richard said: “My dear son Martin has died from injuries sustained in the attack on Boston. My wife and daughter are both recovering from serious injuries. “We thank our family and friends, those we know and those we have never met, for their thoughts and prayers. I ask that you continue to pray for my family as we remember Martin. 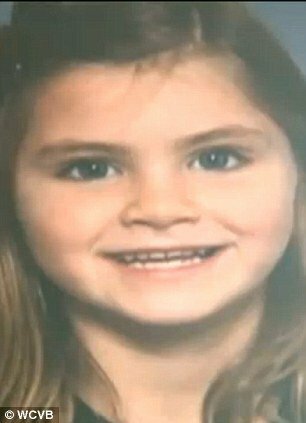 According to NBC News, Bill Richard told a local official that 6-year-old Jane would have also died if not for the heroic efforts of first-responders. Jane Richard had run in a children’s race on Saturday, neighbor Beth Nagy told NBC. She had won a medal and was “all excited”. Rep. Stephen Lynch of Massachusetts recounted what happened at the marathon after speaking to a traumatized Bill Richard. “The kids were all up on the barrier as runners flooded in,” Stephen Lynch said on MSNBC’s Morning Joe. “The dad is a runner, but he wasn’t running yesterday,” Stephen Lynch said. Bill Richard is a popular community leader in Dorchester, a Boston suburb. 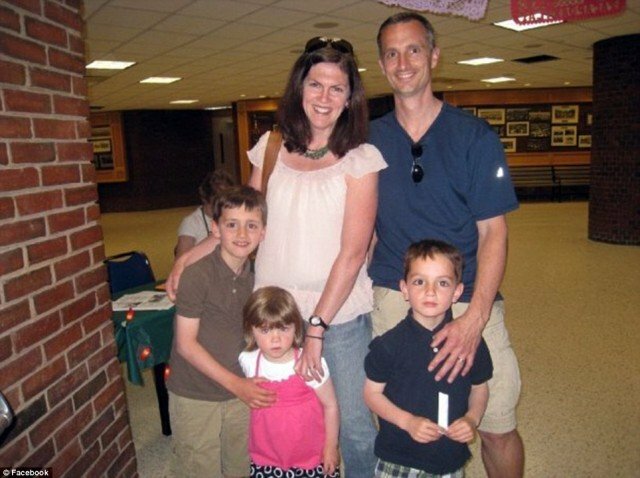 Martin Richard was a keen baseball player, climber and runner and was a member of Savin Hill Little League team. Martin Richard was among at least three people killed in the bombings. Another 176 were injured with some 17 fighting for their lives. CNN reported that at least 10 victims have needed amputations. At least nine of the wounded are thought to be children, including a 2-year-old boy who suffered a head injury. When Bill Richard got home on Monday evening he was unable to speak or even look at his friends and neighbors who were gathered because he was so upset at the death of his son. He came home for around 10 minutes at 10.30 p.m. to get some clothes. Bill Richard is on the St Marks Area Main St Group, a local traders association, and his wife Denise is on the neighborhood watch board. The family is well known in the community and attends a nearby church. Denise Richard also works at the local Neighborhood House Charter School, where Martin and Jane attended. The school’s flag flew at half-mast on Tuesday. In a statement, the school described Martin Richard as “a bright, energetic” boy who had “big dreams” for his future. “The Neighborhood House Charter School is mourning today the loss of our beloved student Martin Richard, during the tragic events at the Boston Marathon yesterday,” the statement read. “He was a bright, energetic young boy who had big dreams and high hopes for his future. We are heartbroken by this loss. Martin Richard was a former student at the nearby Pope John Paul II Catholic Academy. Martin Richard, an 8-year-old boy waiting at the Boston Marathon finish line to give his father a hug, was among three people killed and more than 144 injured in the two explosions. Martin Richard was standing with his mother and sister, who both suffered horrific injuries when bombs hidden in rubbish bins exploded within seconds of each other during the Patriots’ Day bank holiday. Boston police closed off the city as a “danger zone” as witnesses described the “unspeakable horror” of body parts flying through the air and shoes that “still had flesh in them”. At least 17 of the injured people are in a critical condition and it is thought as many as 30 victims may have needed amputations or major corrective surgery on maimed limbs. Today, the US remained on full alert after the worst terrorist outrage since the World Trade Centre towers were destroyed by hijacked jets on September 11, 2001. President Barack Obama vowed to hunt down the culprits and “hold them accountable”. In the UK, Scotland Yard confirmed security arrangements were being reviewed ahead of Margaret Thatcher’s funeral on April 17 and London Marathon on April 21. 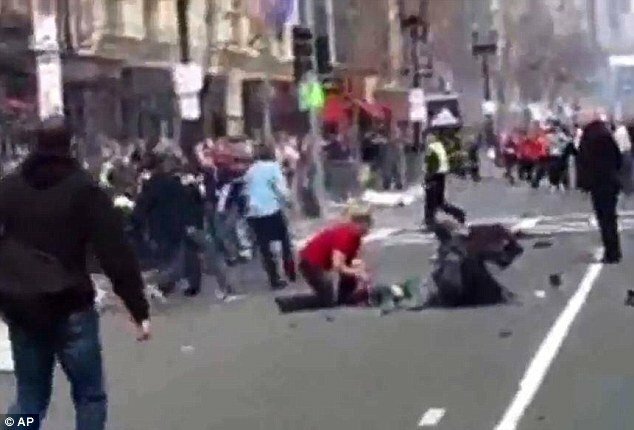 Video footage showed an explosion going off in the heart of the crowd that had lined the streets of the Massachusetts city yesterday to watch the famous sporting event. After the blasts, two more suspicious devices were found in the city’s Mandarin Oriental and Lenox hotels. Both were evacuated and the suspected bombs dismantled. According to the Boston Globe, Martin Richard, from Dorchester, Massachusetts, may very nearly have cheated death after walking out to embrace his father Bill Richard as he went to cross the finishing line. When his walked on, Martin Richard turned back to rejoin his mother and two of his siblings just as the first bomb exploded. Reports suggest his mother was seriously injured and his sister’s leg was blown off. 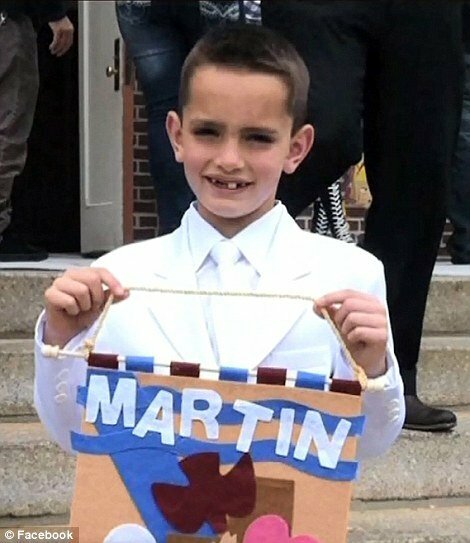 Martin Richard, 8, from Dorchester, Massachusetts, is one of the victims who died in Monday’s Boston Marathon explosion. Martin Richard was killed as he was standing in line waiting to give his marathon running father a hug. Losing his life as two explosions tore through the crowd at the finishing post of the Boston Marathon, Martin Richard was at the race to support his dad Bill Martin, along with his mother Denise Richard and two siblings. Friends held a vigil on Monday night at the neighborhood Tavolo Restaurant in Dorchester for Martin Richard and his mother and sister, who suffered “grievous” injuries in the bombing on Monday afternoon. According to the Boston Globe, Martin Richard had walked out to hug his father as he went to cross the finishing line. Afterwards, his father walked on but the little boy went back to rejoin his mom and siblings – at which point the first bomb went off. Reports suggest that Martin Richard’s mother was terribly injured and his sister’s leg was blown off in the devastating explosion.